Silhouette School Readers: Facebook Doesn't Want You to See This! 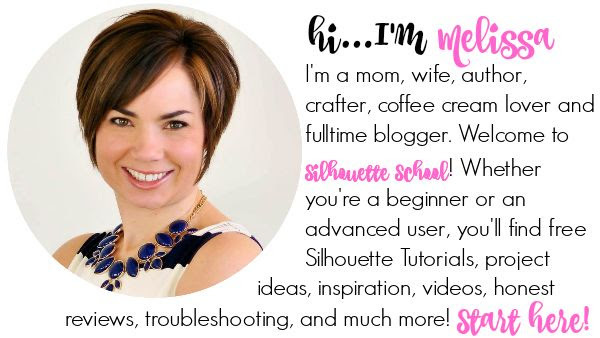 I bet you didn't know Silhouette School posts to Facebook every three hours from 7 am EST to 10pm EST every.single.day. Yup. 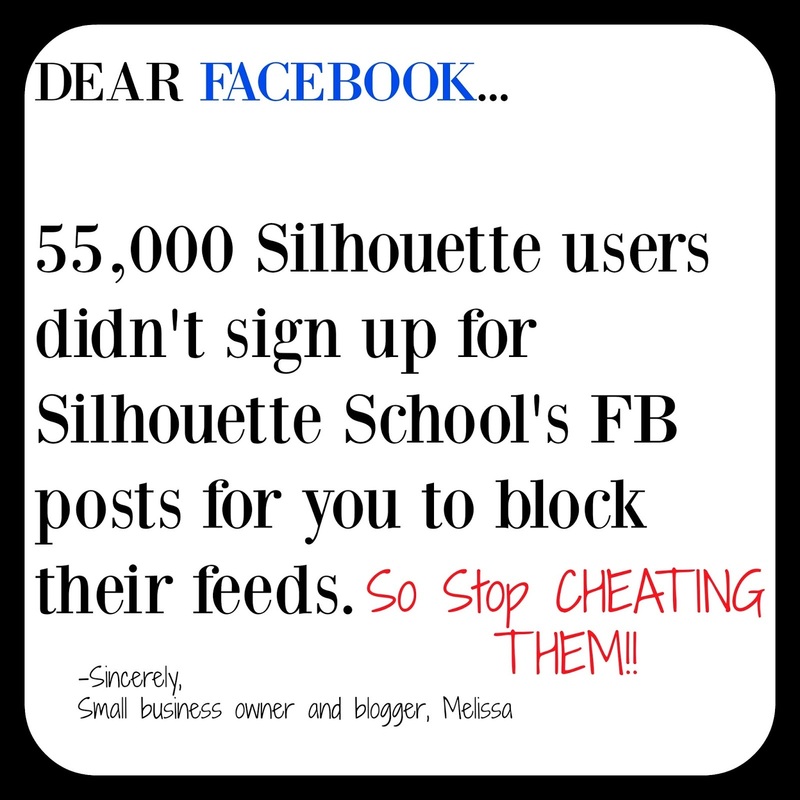 I bet you didn't know because Facebook is most likely not showing you any, if not all, of Silhouette School's posts. How do I know this? Well let's just say 55,000 people have 'liked' the Silhouette School FB page yet this is how many people FB is serving individual posts to....not good! Certain posts that lots of people 'like' - like those adorable Silhouette blade cookies - will get 'served' to even more people...but on average only a small fraction of you are seeing 99% of Silhouette School's post. 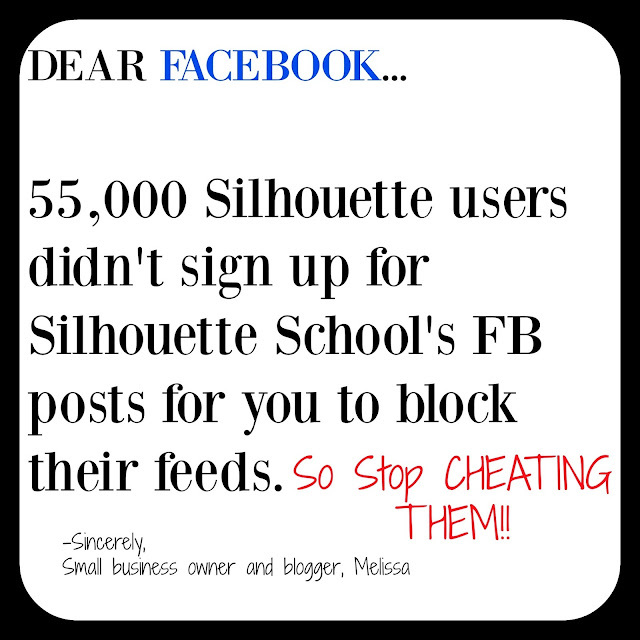 It's a sad thing especially when you voluntarily signed up to follow Silhouette School on Facebook Why, then, should Mr. Zuckerberg and his crew decide when or even if you get to see what we're sharing on the 'Book?! So why does Facebook do this? Well, they want small business owners and bloggers, like myself, to click that 'boost' button and pay for ads on Facebook...the problem is those ads get served to people who may or may not be interested in Silhouette tutorials, tips, tricks, troubleshooting or projects at all! 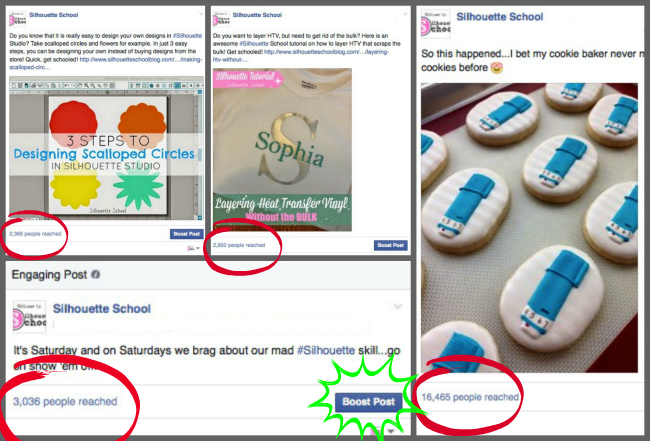 Basically it's throwing marketing money out the window - when all of the 55,000 loyal FB followers actually want to see what Silhouette School has to share, but can't! Lucky for you, I'm going to school you on how to beat Facebook's crazy algorithm so you can see more of Silhouette School's awesomeness in your feed. 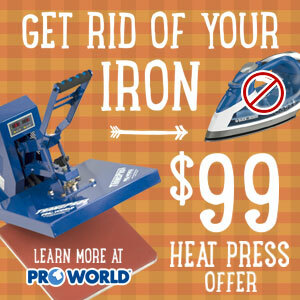 There are several options and you can do one or both! I recommend both, of course! First of all go to www.facebook.com/silhouetteschool. Make sure you've 'Liked' the page. IF IT ALREADY SAYS 'LIKED' DO NOT CLICK AGAIN or you will actually 'unlike' the page. 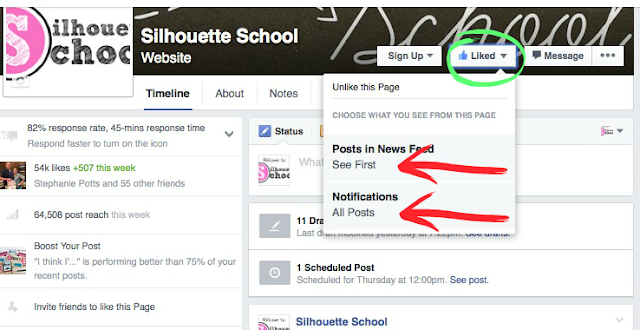 Click the down arrow next to 'Liked' and you should see something like this. Click "Posts in News Feed." 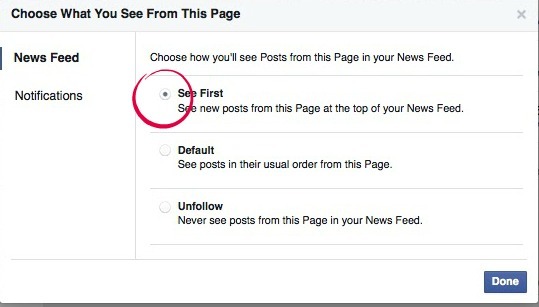 If you'd like the most recent Silhouette School posts to be at the top of your news feed when you open up Facebook, chose "See First". Do NOT click DONE yet! On the left of that same window, click "Notifications". 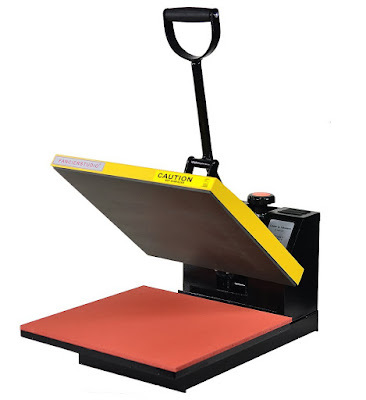 Check 'All Posts" or whatever types of Silhouette School posts you'd like to be notified about. 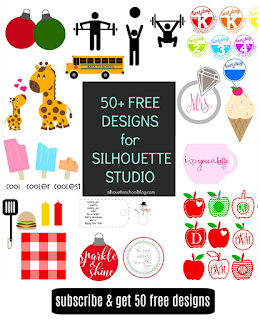 If you start to notice you are seeing fewer Silhouette School posts again, I promise you it's not because I closed up shop or am no longer on Facebook - it's because Facebook is up to its old tricks and reset your settings. In that case, check your 'Liked' selections again and re-save if necessary. Facebook drives me crazy the way they manipulate the news feed. If I hit the "Like" button it means I WANT to see these posts. The users should have 100% control over what shows up in their own news feed. Another pet peeve of mine: there is no way to permanently set the news feed to "most recent"--it constantly reverts to "top stories" and I have to reset it every day. Sometimes FB is more trouble than it's worth! They keep "suggesting" feeds, but hide what you've signed up to see. Thanks for the tip, settings will be set! I have become very discouraged with facebook lately. A couple friends and I have a scrapbooking studio and we let people know what is going on as far as crops ect. through facebook. I'm an Admin on the page and sometimes I don't even see our posts. I'll have to recommend our friends do this with our page too. Thanks so much for the heads up about this, I really appreciate it. thanks for the info. I am new to Silhouette and have learned so much from you already. Would hate to miss anything. 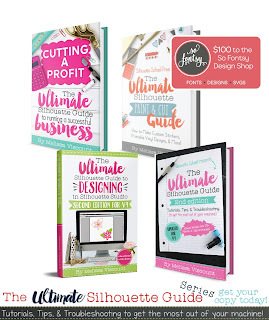 You need to position yourself as the go-to solution for your customers. That means showing them exactly what you can do for them and how you can help their business to run more smoothly. Make sure you communicate clearly the importance of information technology to any business. All in all, binary trade is a quicker type of trading which is gaining more and more popularity among traders and binary options brokers. A trader takes calculated risks and has more chance of earning a profit in binary trading, as compared to the more conventional stock exchange system. 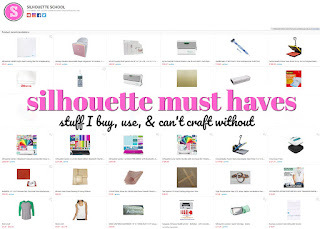 I don't use Facebook and rely on your daily blog entries to keep up since I'm a new Silhouette Cameo user. Thanks for that! Thank you Melissa, this gives a long way to explain why the posts I see change from moment to moment. It is so frustrating. As a business owner, neither you nor your customers/clients/followers are being well served by FB. I have talked with numerous people who say they have dumped FB. Maybe the quest for $$ outweighs customer care. To be honest, I mainly use FB to track family and friends - maybe one or two days a week. One of the many reasons I try and stay away from Facebook and receive your content via your emails. Thanks for all the hard work! 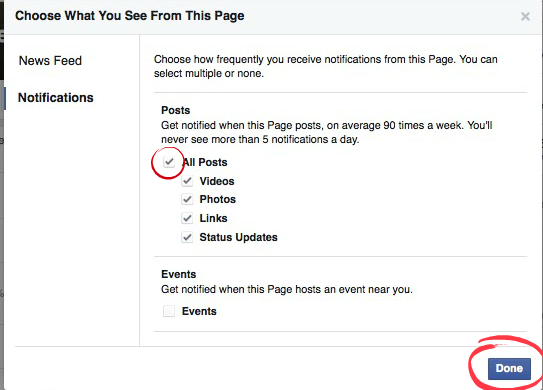 Is there anything you post on your FB feed that you don't post on your blog? I realized I see your blogs, and Instagram (love 'em!) but I wasn't seeing your FB Feed. Interesting. I do not see the second screen with the viewing options (video, etc.) nor do I have a DONE button! I've selected 'Like' and receive notifications at the top of the feed. We'll see if I see any more than I was previously. I knew you posted every 3 hours, but FB is so quirky these days I tend to rely more on the content of your e-mails. I still look for you on FB, though! Well now! Isn't that just dandy of Facebook to decide what I do and don't want to see in my newsfeed? Luckily, I don't rely on Facebook for much of anything. I signed up for email delivery right after I got my Cameo. Works like a charm every time! Thanks for the info though, I find it most interesting!!!! A friend also told me that if you click like on individual posts that it increases them showing up on your feed. Since I have been doing this it seems I see more of what I want to see. As long as you remember not to get inhibited on failed techniques, you may locate it enjoyable creating them. The amount of time and also initiative will feel better when you take your next trade and it works based on something you developed. Thank you so much for posting this, Melissa! 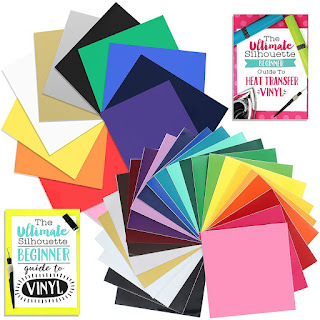 I just launched a new website for my little online shop, and I noticed that of our 35 followers, my announcement post only reached 6 of them! Ridiculous. I have written a note on my Facebook page instructing my followers to come here for your tutorial on how to change their settings. Thank you again! Here it is, May 4, 2016 and I followed your "directions" from November and am so glad that I did!!! .... I love seeing the automatic posts each day ... interesting though ... they NEVER show up in the personal notifications list. That's ok, at least now I know to look for any missed posts. Could you maybe "date" each one? i.e. TODAY "x" date post? or something similar? Maybe a list of posts by title/date? I search the blog religiously ... and am not always certain of the "subject" that I need to search. You are my number one go to .... just looking for another/tracking way to see ALL that you post. Thanks!